VICTORIA - British Columbia's upstart Green party has set up a negotiating team and is planning a series of chess moves that could shake the direction of the province following last week's inconclusive election results, says deputy party leader Matt Toner. 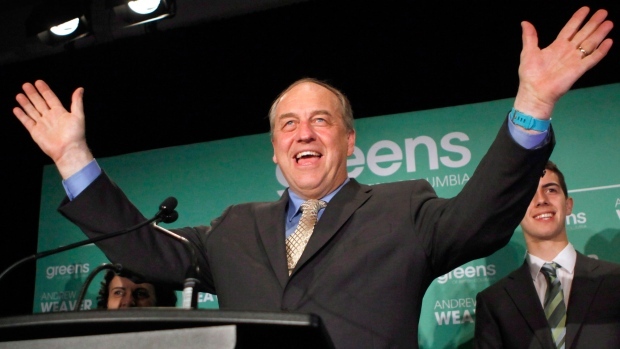 The splintered election outcome that saw the Greens win three seats and potentially hold the balance of power in an 87-seat legislature has Green leader Andrew Weaver calculating the benefits of co-operation agreements with the Liberals and New Democrats, Toner said Tuesday. The Liberals and New Democrats are gridlocked as they await the final ballot counts from last week's election, but the Greens are setting priorities to use the leverage that its newly elected members achieved. The Greens announced Tuesday that Weaver will serve as the party's chief negotiator in the upcoming political talks. The rest of the team consists of newly elected MLA, Sonia Furstenau; Liz Lilly, the party's chief of staff, and Norman Spector, a former political aide for prime minister Brian Mulroney and B.C. premier Bill Bennett. “British Columbians need effective government and Andrew Weaver is the key to providing it after this most unusual election,” said Spector in a statement. He said he is not working with the Liberals. “There's been no shortage of opportunities to work together on a whole range of things and they've chosen not to,” said Horgan. He said the NDP and Greens share common interests about public education, public services, the environment, electoral reform and “getting big money out of politics,” in a reference to election campaign fundraising. Premier Christy Clark said Tuesday after meeting with her caucus in a Vancouver hotel that she has also spoken with Weaver and Horgan since the election. She said the election result showed her that voters want the parties to work together. “That collaboration begins with me, as your premier,” said Clark. She said it is too early to discuss the workings of any possible political deals. “We are in a unique time in British Columbia's history,” said Clark. Toner says there is a basis for potential co-operation with both parties. He said the Greens are looking for specific proposals from each party on electoral and campaign-finance reforms before lending support in the legislature. Toner said Weaver's approach to the election drama is much like a political chess match. Toner said he considers the differences between Clark's Liberals and the Greens to be vast on several fronts, but does not rule out working with the Liberals. Clark's Liberals won 43 seats on May 9 while the NDP collected 41. The Liberals need one more seat for a majority government. The outcome remains unclear while 176,000 absentee ballots are counted, which could flip close ridings including Courtenay-Comox, where the NDP won by nine votes. Even after the final results are announced May 24, tight finishes could trigger judicial recounts.